Classical music is not as big of a tradition in the Dominican Republic as it is in some other locations, and opportunities for young musicians are limited there. “But when you have a passion about something, life sends you the way,” says Darwin Aquino, an FIU graduate who was recently named Conductor in Residence for the Washington University Symphony Orchestra in St. Louis. Darwin graduated from FIU in Spring 2015 with a Master of Music in Orchestral Conducting. However, his interest in composing music began early. He started by creating short pieces and playing them on his violin for fun. From there, he learned how to write his compositions in music notation and compose them for the piano. With the guidance of teachers over the years, he began to write bigger compositions meant for chamber music and orchestra. His skill earned him the first prize of a major composition competition in the Dominican Republic, which led to his acceptance into the National Strasbourg Conservatory in France. In France, he had the opportunity to specialize in contemporary composition. “That opened the doors for me, and my music to begin to be premiered internationally,” Darwin says. Darwin decided to come to FIU after meeting Professor Robert Davidovici, Artist-in-Residence and Professor of Violin in the School of Music. “As many times in life, everything starts with a person you meet,” says Darwin. Davidovici traveled to the Dominican Republic to teach string masterclasses and to serve as concertmaster of the Santo Domingo Music Festival. Darwin met Davidovici when he took his violin students to Davidovici’s class. Darwin says that FIU made him a conductor by providing opportunities that are not widely available at other music schools. As a student, he was able to get plenty of podium time conducting the FIU Symphony Orchestra and was even able to conduct opera performances. Currently, Darwin maintains a busy schedule in St. Louis. He will conduct the Winter Opera Saint Louis productions of “L’Italiana in Algeri” and “Norma” and will be conductor-in-residence for Washington University’s “Carmina Burana”. He also has many commissions as a composer. Darwin will return to Miami for the FIU Concerto Winners’ Concert with the FIU Symphony Orchestra. 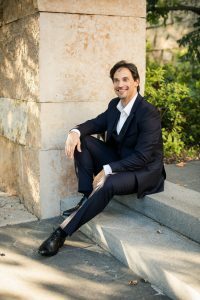 The concert will feature the world premiere of his first violin concerto, a piece he composed as a thank you to FIU, the School of Music and its faculty, the Symphony Orchestra, and Professor Davidovici.